“There are 124.5 million Americans in their prime working years (ages 25–54). 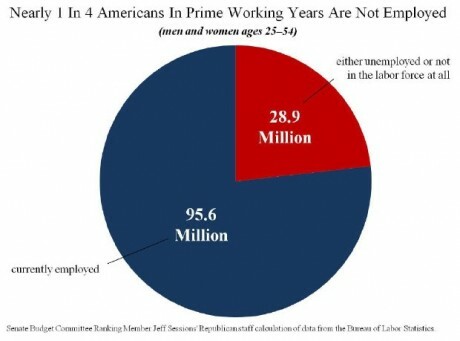 Nearly one-quarter of this group—28.9 million people, or 23.2 percent of the total—is not currently employed. They either became so discouraged that they left the labor force entirely, or they are in the labor force but unemployed. This group of non-employed individuals is more than 3.5 million larger than before the recession began in 2007,” writes the Republican side of the Senate Budget Committee. Clearly, we have never recovered from the impact of the last recession. But let’s try to put these numbers in context. Below, I would like to share two charts with you. 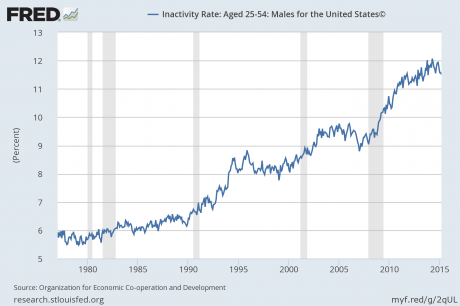 They show what has happened to the inactivity rates for men and for women in their prime working years in the United States in recent years. In order to be considered “inactive,” you can’t have a job and you can’t be looking for a job. So this subset of people is smaller than the group that we were talking about above. The 23.2 percent of Americans in their prime working years that are unemployed right now includes those that are looking for a job and those that are not looking for a job. These next two charts do not include anyone that has a job or that is currently looking for a job. These charts only cover “inactive” people in their prime working years that are not considered to be in the labor force. 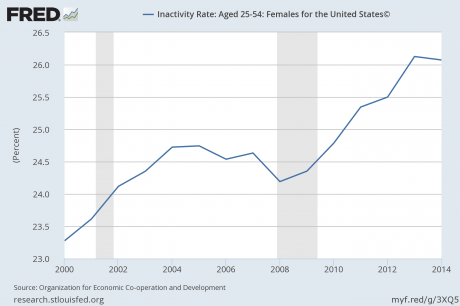 For both men and women in their prime working years, the inactivity rate is even higher than it was during the last recession and is hovering near the all-time record. All of these people neither have a job nor are they looking for one. Have these people found rich spouses to marry so they don’t have to work? No, the truth is that the middle class in America is steadily eroding and poverty is absolutely exploding. Credit card debt has soared to a new record high, and 48 percent of all U.S. adults under the age of 30 believe that “the American Dream is dead." The issue isn’t that people don’t want to work. The issue is that people cannot find enough work. And even if you have a job, that does not mean that you are on easy street. According to the Social Security Administration, 51 percent of all American workers make less than $30,000 a year. Tens of millions of Americans are now among the ranks of “the working poor." So many families are watching their expenses soar while their paychecks go down or stagnate. If you are in this situation right now, then you probably know how exceedingly stressful it can be. Health insurance premiums have increased faster than wages and inflation in recent years, rising an average of 28 percent from 2009 to 2014 despite the enactment of Obamacare, according to a report from Freedom Partners. And I am not exactly sure where they got those numbers. Personally, I know that my health insurance rates have gone up far faster than that. Two years ago, my health insurance company wanted to double the health insurance premiums for my family even though we never get sick. So I switched to another insurance company that offered a policy that was only about 30 percent higher than my last one. But then when it came time to renew, that insurance company wanted to raise my rate by another 50 percent. Thanks to Obamacare, American families are being absolutely crippled by the cost of health care. And of course we are seeing the rising cost of living so many other places as well. Our paychecks are being squeezed harder and harder, and this is absolutely killing the middle class. In fact, the middle class in America is now a minority for the first time ever. And now for the real bad news – this is about as good as things are ever going to get in this country. As you can see from what I have shared above, we never really had any sort of meaningful “economic recovery," and now we have entered the early phases of the next major downturn. So where do we go from here? Unfortunately, our debt-fueled prosperity has provided us with a massively inflated standard of living that is not even close to sustainable. As this bubble bursts, the economic pain is going to be absolutely unprecedented. But it won’t be just economic pain that we are facing. In my new book, I detail the things that I believe that are coming to this country, and I explain why the entire planet will soon be facing incredibly challenging times. It is going to be one of the most controversial Christian books of 2016, because it directly challenges many of the things that are being taught in mainstream churches today. My book is an ominous message of warning and an inspiring message of hope, and I truly believe that it is the most important thing that I have ever written. No matter how you may see the future, the key is that we all learn to love one another. The years ahead are going to be extremely challenging, and those that want to chase everyone else away and survive as lone wolves are going to have a very rough time. We all need each other, and those that have friends, family and communities around them are going to be in a much better position to weather the coming storms. Take a look at the future of America: The Beginning of the End and then prepare.